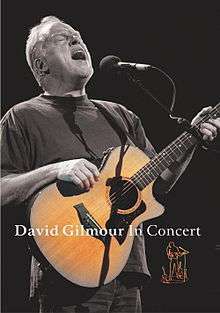 David Gilmour in Concert is a DVD of Pink Floyd guitarist David Gilmour's solo concert at the Royal Festival Hall, London in June 2001, as part of the Robert Wyatt-curated Meltdown festival. It also features additional footage recorded during three concerts at the same venue in January 2002. The track selection includes several Pink Floyd compositions in addition to Gilmour's solo works. Guest appearances are made by Floyd colleague Richard Wright, as well as Robert Wyatt and Bob Geldof. It includes the first ever performance of "Smile" a track which would appear almost five years later on Gilmour's third solo album - On an Island, and Gilmour even plays a few Syd Barrett compositions. Also included is "Je crois entendre encore" ("I still believe I hear"), an aria from Georges Bizet's opera Les pêcheurs de perles (The Pearl Fishers),  with a libretto by Eugène Cormon and Michel Carré, and sung by Gilmour in the original French. Richard Wright – vocals on "Breakthrough", keyboards on "Breakthrough" and "Comfortably Numb"
The 30 minutes of special features on the DVD include the tracks "I Put a Spell on You" (from Later with Jools Holland from June 1992), "Don't" (from a Leiber-Stoller Tribute concert from June 2001), and a performance of Shakespeare's Sonnet 18 (recorded on Gilmour's houseboat The Astoria). Additionally, there is a version of "High Hopes" performed by Gilmour's backing vocalists. Finally, there are lyrics, a home movie of the band and choir rehearsing at home, and a 'Spare Digits' feature - a camera on Gilmour's fretboards during six guitar solos. “ How did you go about choosing the material for the shows? I went through the entire Pink Floyd catalogue, and I picked the tunes I liked. Then, after I figured out which ones would work with the instrumentation I had in mind, I spent about three months fiddling around in my home studio mocking up the arrangements. 1 2 "David Gilmour "In Concert"". Utopia.knoware.nl. Retrieved 9 September 2012. 1 2 3 4 Manning, Toby (2006). "Which One's Pink?". The Rough Guide to Pink Floyd (1st ed.). London: Rough Guides. p. 146. ISBN 1-84353-575-0. 1 2 3 4 Manning, Toby (2006). "Floyd on Film". The Rough Guide to Pink Floyd (1st ed.). London: Rough Guides. p. 268. ISBN 1-84353-575-0. 1 2 3 4 Schaffner, Nicholas (2005). "Afterword – High Hopes". Saucerful of Secrets: The Pink Floyd Odyssey (New ed.). London: Helter Skelter. p. 326. ISBN 1-905139-09-8. 1 2 3 Schaffner, Nicholas (2005). "Afterword – High Hopes". Saucerful of Secrets: The Pink Floyd Odyssey (New ed.). London: Helter Skelter. p. 327. ISBN 1-905139-09-8. ↑ Mabbett, Andy (2010). Pink Floyd - The Music and the Mystery. London: Omnibus Press. ISBN 9781849383707. ↑ "Music | In Concert | Official Website". David Gilmour. Retrieved 9 September 2012. 1 2 "Pink Floyd news :: Brain Damage - David Gilmour - In Concert". Brain Damage. 21 July 2012. Retrieved 9 September 2012. "Chicago – Change the World"